The new Concentric Inc. oil pump chosen by Caterpillar for its 3126 engine has delivered important technical and economic advantages compared with the original pump fitted in earlier versions of the engine. 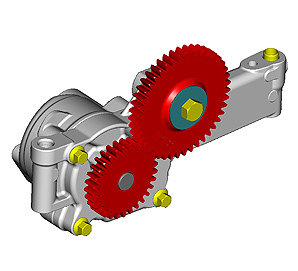 The new pump employs rotor technology in place of the co-axial gear design of the earlier pump, not manufactured by Concentric. Although Concentric Inc. was working within the original space envelope, it was able to achieve a 10% flow increase with a compact, cost-effective and lightweight pump design. Smooth operation, and therefore low wear, is a feature of the Concentric pump. In this case, the rotor set has been designed to achieve an increase of some 10% in the flow by increasing the inlet area compared with a conventional design, whilst maximizing efficiency and minimizing wear and cavitation. Caterpillar's 3126 is a 6-cylinder engine of 7.2 litre displacement, rated at 170 bhp. Designed for use in truck, marine and off-highway applications, it features low-emissions, exceptional weight to power ratio (2.41kg/bkW) and the patented HEUI (hydraulically-actuated, electronically-controlled unit injector) fuel system. Based in Itasca, Illinois, USA, Concentric Inc. is one of three manufacturing plants within the Concentric Group, a major supplier to the world's truck, agricultural and construction equipment industries. The company manufactures oil, water and fuel transfer pumps, as well as integrated front cover assemblies for diesel engines. In addition, it also supplies lubrication pumps for transmissions and reciprocating compressors and fans for engine and other applications.